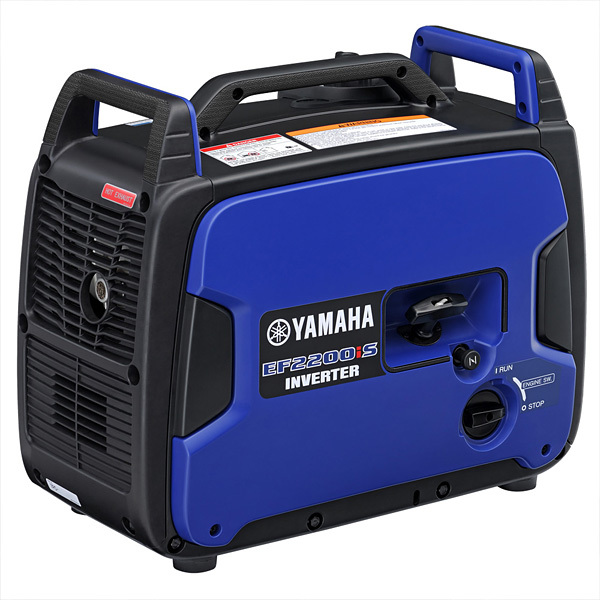 The All New EF2200iS Inverter GeneratorYamaha’s Outdoor Power Equipment group is excited to announce the launch of the all new EF2200iS Inverter Generator. The all new from the ground up design is where high power output meets bold new features. The EF2200iS was built with RV camping in mind andneeded to accommodate a wide variety of uses in a powerful, but easy-to-transport package. The inverter is outfitted with a wide variety of new features starting with 30 amp RV outlet, Tri-Handle design for easy transport, an LED illuminated control panel for easy operation both day and night and many other new features as well as proven Yamaha Core Technology to deliver a powerful, quiet, and lightweight generator to the modern camper. Light Weight - 55 pounds; easy to move, transport, and store. Tri-Handle Design - Makes moving the generator around the campsite or worksite a breeze with one or two people. Super-Quiet - Quiet operation allows you to have a conversation near the generator - and you may not even realize it's running (57-65dBA). Inverter System - Supplies clean power featuring Pulse Width Modulation (PWM) to safely power laptops, tablets, and more. Yamaha MZ80 Engine - OHV, air-cooled, single cylinder, 4-stroke. Smart Throttle - This load sensing rpm control allows greater fuel efficiency, longer run times, and noise reduction by automatically adjusting engine speeds to match the load. Yamaha Smart Dial - Simplifies the starting and stopping of the generator. LED Illuminated Control Panel - Makes it easy to check the status of your generator both day and night. The control panel features a multi-function display as well as an illumination light that cascades over the entire control face of the unit for easier low light operation. 15A 120V Duplex - Just like your home outlet to provide power to all of your everyday devices. RV Outlet - Provided standard so you don't have to search for the right adapter to power your RV. DC Outlet - 3A,12V outlet allows more devices to easily connect to the generator. Overload Power Reset - In the event of a power overload, this feature enables the device to restore power without shutting the unit down by holding down the reset button for up to three seconds. Yamaha Easy Carburetor Drain - Allows you to empty the fuel from the carburetor to help prevent stale fuel problems and prepare the unit for long term storage. Convenient Tool-Free Maintenance Panel - Allows you to access critical engine components for easy service of your unit. TwinTech Capability - Allows you to connect two EF2200iS units together to provide 30 AMPs of rated power.